Barafu camp is a bit of a staging post, for those going to summit and for those coming back so at around 16h00 it’s busy with those coming up from the lower levels and for those coming back from the previous night’s summit. This is the time set aside for sleep in preparation for the summit push. As you can imagine, it’s near impossible to get a good rest and after 4 previous nights of very little sleep the call to get up for a late dinner was not exactly welcomed with good cheer. This entry was posted in Challengers, Kilimanjaro on 25th March 2019 by Life Changing Challenges. 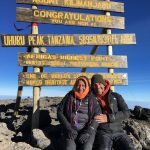 This entry was posted in Challengers, Kilimanjaro on 18th March 2019 by Life Changing Challenges. It’s a strange feeling sitting in the shadow of the tallest object on a continent – yet not being able to see it! It was the day before the start of the climb and we were in the hotel just killing time when we started to wonder why, after two days in the country we still had yet to catch even a glimpse of the mountain. The local staff had advised us that the mountain was visible only in the early morning or late evening when the clouds shifted but still…at 5,895m we should be able to see something?! This entry was posted in Challengers, Kilimanjaro on 11th March 2019 by Life Changing Challenges.